This letter arrived at our house yesterday. I've messed around with the photo a little (to protect our privacy), but on the original you can clearly see our house number and street address, under a long-departed previous resident's name. 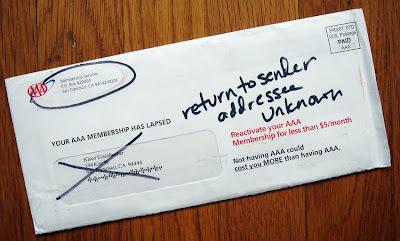 Well, you can as long as you ignore the large black cross my wife added to the envelope the first time it passed through our mailbox about a week ago, along with the big circle round the return address and the lettering that says "return to sender addressee unknown." Maybe we missed some detail of the US Postal Service's protocol for correctly marking return mail, but the intention seems fairly clear. While I realise that much of the sorting system is automated these days, I was still labouring under the delusion that someone human would look at a letter before it gets delivered. Perhaps not. We've now released this salmon-like letter back into the wild, intrigued to see if it manages to find its way to the wrong destination for a third time.